The tourism field includes ferry tickets from Patras or Igoumenitsa to the ports of Ancona, Bari, Brindisi, Venice and Trieste in Italy. Also, from the ports of Italy to Greece. 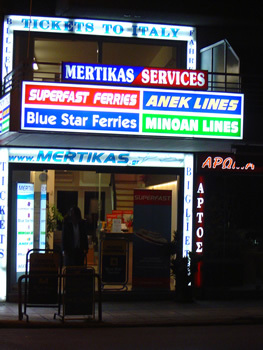 The companies that we represent are Superfast Ferries, Blue Star Ferries, Anek Lines, Minoan Lines, Maritime Way and Med Link Lines. Camping on board available for all companies.